The town of Brinkley Springs is about to become a hunting ground. Five otherworldly beasts descend upon the populace, their hunger for death and destruction insatiable. Levi Stoltzfus finds himself amongst those in danger, yet he proves anything but helpless. Along with some unexpected allies, magus Levi must discover the identity of the ravaging monsters, and figure out a way to stop them. 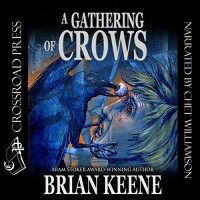 To show support for the author Brian Keene, of whom suffered an accident and has subsequent insurance issues, Horror Aficionados selected this title for the monthly group listen in July. I simply had to join in as it was a good cause, and I’m all for helping a writer in need. As for the audiobook in general, well, I was at first put off by the narrator, Chet Williamson. Don’t get me wrong, Chet wasn’t bad at all, but his voice took a while to get used to. If I were to describe it, the words “powerful” and “booming” come to mind, so it was a very intense experience indeed. I also found it difficult to distinguish between characters at times, especially when it came to the male personalities. After some hours, however, I was able to get into the rhythm of Chet’s mighty voice-over and focus primarily on the story. Despite being the third installment in the series, this one sufficiently stood as an independent volume - as far as I’m aware, the adventures of Levi Stoltzfus can be enjoyed in any order. Of course, there are running themes throughout, but Keene always seemed willing to share lengthy, yet relevant information and pieces of history. The story begun as rather slow, with the repetition of certain details. If there’s one specific thing that irks me in any form of media, it’s the retelling of something that I already know. Brinkley Springs was a dying town, I understood that the very first time it was stated, and I really didn’t need to be reminded with the introduction of every new character. It may be a minor thing to some, but for me it’s a personal grievance. It became apparent that most of the beginning was comprised of useless, and not very interesting, elements of people's lives. They did little to connect me to the residents, as soon enough they would fall victim to the monsters. What I wanted was to get familiar with the man himself, but Levi's appearance took time to come about, and when it did, it usually wasn't for long. The further the plot progressed, the more I came to enjoy it. Levi's presence eventually became the main focal point; his investigation of the horrific occurrences afflicting the town improved my overall feeling of the book. There was a tremendous amount of death, and it, in all its graphic glory, had very little in terms of limits. Children, animals, the elderly, all were fair game and sought out like animals. Whilst the aftermath was largely centred upon - the state of the bodies after the initial murder, there were a few scenes that depicted the actual killing. It was brutal, and I do favour brutality. I can't say I became attached to anyone but Levi, and even then I believe that to be able to fully appreciate him I'd have to delve further into the series; from what I could gather, his history was certainly intriguing. As for the others, well, there was a romance I didn't care about, and the surviving group in general didn't strike me as anything special. The villains, whilst amusing with their shape-shifting shenanigans, were awfully single minded and thus had little depth. I suppose that was the point; they were minions, set upon one specific goal. My interest soared to new heights when the mythology of The Thirteen came into play. I don’t know much of Keene’s Lovecraftian lore, but by goodness I devoured it. To be honest, it was the best thing about the entire novel; the snippets of information relating to these nefarious entities. Due to my fascination, it was therefore a real treat when Levi transported himself to another realm right at the end. I actually couldn't get enough of it. In conclusion: It was a very weak beginning, but it improved, and by the end I was well and truly drawn into Keene's Labyrinth Mythos. There's no doubt that I'll be seeking out more of his work. Brinkley Springs may have been dying, but it doesn't deserve to be murdered.